In his book What Justice Demands: America and the Israeli-Palestinian Conflict, Elan Journo purports to offer a fresh pro-liberty approach to the subject, but its pages are filled with all the same tired Zionist propaganda that has always been used to justify Israel’s crimes against the Palestinians. Exposing a Zionist Hoax systematically deconstructs the lying propaganda that pervades the mainstream discourse, setting the historical record straight about the true causes of the conflict, the reasons for its persistence, and the path forward to a just peace. Hey! 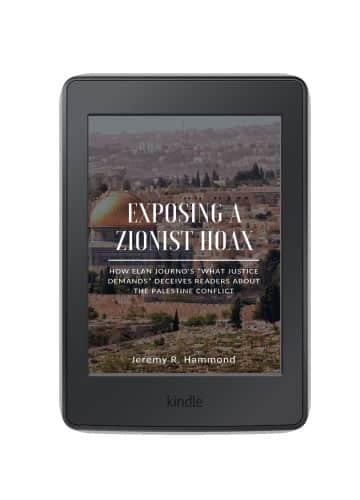 I’m Jeremy R. Hammond, the author of the book Exposing a Zionist Hoax. I’d like to tell you the story of how this book came to be and why I think you’ll benefit from reading it. As a firm believer in the libertarian principle of non-aggression and author of the book Obstacle to Peace: The US Role in the Israeli-Palestinian Conflict, my interest was piqued when I received an advance review copy of Elan Journo’s book What Justice Demands: America and the Israeli-Palestinian Conflict. In this book, Journo purports to offer a fresh, pro-liberty, pro-rights, and pro-justice approach to the subject. That sounded good to me. Yet as is made clear right from the start, his approach is also unabashedly supportive of Israel’s policies toward the Palestinian inhabitants of the region. I naturally wondered how Journo would try to reconcile these two irreconcilable views, given the oppressive nature of those policies. My assumption is that he would try to do so by simply denying the oppression, which proved to be the case. 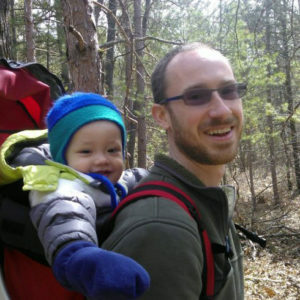 Journo’s central thesis is that the if the Palestinians were allowed to exercise their right to self-determination, they would establish either a dictatorship or an ISIS-like Islamic theocracy, and therefore they must not be allowed to exercise that right; rather, the US should provide Israel with the political backing it needs to violently suppress any semblance of resistance to Israel’s benevolent occupation regime! So much for being pro-liberty! But it wasn’t just that his thesis is irreconcilable with a pro-liberty approach. While claiming to offer a fresh, unique analysis of the situation, Journo’s book simply regurgitates all the same tired Zionist propaganda that has always been used to try to justify Israel’s crimes against the Palestinians. It was page after page of demonstrable lies and deceptions. It was, to be blunt, nothing less than a hoax. The fact he was trying to do so under the guise of being pro-liberty just rubbed me the wrong way, and so I was compelled to write a response. While reading, I had highlighted and made notes in my copy, and upon completion immediately sat down to write up a rejoinder, to expose his hoax claims. But no simple few-hundred word review would suffice. To fully expose this hoax would require a book-length treatise. So I wrote one. Because I had already done all of the necessary research to be able to demonstrate how Journo’s book aims to deceive readers, I was able to write and publish my response in just a couple of weeks, and published my e-book Exposing a Zionist Hoax the same day What Justice Demands was published (June 12, 2018)! Exposing a Zionist Hoax is not really about Elan Journo or his book. It’s about the fictions the general public are indoctrinated into believing, which serves to perpetuate the tragic violence. The relevance of his book is just the fact that someone could write and publish such a hoax with the believe that they can get away with it! This says a lot about the society we’re living in today, and that’s just not acceptable to me. It is not okay that people lie and deceive in order to manufacture public consent for crimes against humanity. I strongly believe we can change that situation, and in doing so open the path to a truly just solution. My goal with Exposing a Zionist Hoax is twofold: (1) to educate my readers by systematically debunk popular Zionist myths that are standard in the mainstream discourse, and (2) to take a stand against this hatred and deliver the message to Zionist propagandists like Journo that they can’t continue to get away with lying and deceiving people in order to defend Israel’s crimes against the Palestinians. The people of Palestine and those who defend their human rights have no greater weapon today than the truth. And I strongly believe that the truth will prevail. No Arabs were wrongly dispossessed of their land during the Mandate era because Jews legally bought the land from Arabs. The cause of outbreaks of Arab violence against Jews during the Mandate was the Arabs’ inherent hatred of Jews and rejection of the Jews’ right to self-determination. UN General Assembly Resolution 181, the famous “partition plan” resolution, was a reasonable “compromise” that was rejected by the Arabs simply because they couldn’t stand to see Jews exercising their right to self-determination. Resolution 181 conferred legal authority to the Zionist leadership for their unilateral declaration of the existence of the state of Israel on May 14, 1948. In response to that “Declaration of Independence”, the neighboring Arab states launched a war of aggression by invading Israel in order to wipe the nascent state off the map. There was no ethnic cleansing of Arabs from their homes in Palestine, and the Palestinian refugee problem is simply a tragic consequence of an Arab war of aggression against Israel. Palestinians refugees alive today have no right to return to their homeland. On June 5, 1967, Israel acted in self-defense by launching a “preemptive” strike against Egypt in the face of an imminent Egyptian invasion of Israel. The Palestinians living within the Gaza Strip and West Bank have benefited greatly from Israel’s occupation those territories. The legal status of the Gaza Strip and West Bank, including East Jerusalem, is “contested”, as is the legal status of Israel’s Jewish settlements in the West Bank. There are no laws or policies of the Israeli government against Arabs living as citizens within Israel that warrant condemnation. The term “Palestinians” did not come into popular use until the 1960s; i.e., Arabs were not known as “Palestinians” prior to Israel’s establishment. No Palestinian national movement existed until the 1960s; i.e., there was no Palestinian national movement prior to Israel’s establishment. The existing Palestinian national movement has no legitimate cause; i.e., the Palestinians are not struggling for freedom and Israel has not thwarted their national aspirations. The Palestine Liberation Organization’s (PLO’s) presence in Jordan and Lebanon, the Palestinian Authority (PA) established under the Oslo Accords, and Hamas’s rule of Gaza represent consequences of Palestinians exercising their right to self-determination. Hamas came to power in Gaza by committing a coup against the government of PA President Mahmoud Abbas in order to launch a war of jihad against Israel. Israel acted in self-defense by launching Operations Cast Lead (2008-2009), Pillar of Defense (2012), and Protective Edge (2014) to stop incessant rocket fire from Hamas. During these operations, Israel committed no war crimes against the Palestinians, but did everything possible to avoid harm to civilian persons and infrastructure. The US government “assumed the role of a peace maker” under the “peace process” and has supported the two-state solution for over two decades. The “peace process” has been counterproductive toward the aim of realizing a just peace because the US has not been supportive enough of Israel’s policies toward the Palestinians. Don’t be bamboozled by the lies that we are perpetually inundated with by government policymakers and the thought-controlling media and intelligentsia. These lies are perpetuated in order to manufacture public consent for the continuation of the US’s longstanding policy of supporting Israel’s crimes against the Palestinians and blocking implementation of the two-state solution. Therefore, one of the solutions to this problem is to properly inform the public about the true nature of the conflict and debunk the pervasive falsehoods that have served to perpetuate it for so long. It is to that end that I wrote Exposing a Zionist Hoax. I invite you to empower yourself with the knowledge to become an effective voice for a truly just peace by buying my book and start reading it today. I hope you find it insightful and informative! As usual, when it’s a book written by Jeremy Hammond, you can expect forensic research, well grounded, factual, concise writing. His latest book “Exposing A Zionist Hoax” doesn’t disappoint. In examining Elan Journos book “What Justice Demands: America and the Israeli-Palestinian Conflict” he cuts through the pseudo “liberterianism” which Journo purports to write from and exposes it for what it is: a Hasbara (israeli propaganda) Hoax! … Where Journo sins by omission, in glossing over pertinent, and uncomfortable, truths, for Israel that is, Hammond makes sure to give us the missing factual history. Hammond’s books are always impeccably well researched, with verifiable links to historical fact and documentation…. If you’re genuinely interested in the subject of Palestine and Israel, and you want to read the FACTS…. get this book, indeed, get any of Jeremy Hammond’s books, and you’ll be struck by how well written, concise, and well researched they are. It’s great to see that one of our respected authorities on the Palestine/Israel conflict has responded quickly to the disinformation and propaganda attempting to be spread by Elan Journo. It may not be as easy for the Hasbara army to deceive the American public due to the growing global recognition of Israel and the Likkud party, as a terrorist, apartheid state. Forensically replacing fiction with fact! Not only does Jeremy R. Hammond in this book meticulously debunk the biased and misleading nature of Elan Journo’s book, he does so by carefully educating his readers with historically verifiable facts. Hammond deconstructs Journo’s product idea by idea, in the process providing his readers with the means to see through the camouflage of other such works of pro-Israel propaganda. The book does accomplish what it set out to do: it demolishes the Zionist propaganda of a rabid Israeli apologist. Mr. Hammond persuasively demonstrates that the partisans of this supremacist movement have been guilty of numerous egregious war crimes against the native Palestinians…. JEREMY HAMMOND’S BOOK CAN BE RECOMMENDED to anyone who wishes to avoid the traps laid for the uneducated in What Justice Demands: America and the Israeli-Palestinian Conflict, by Elan Journo. Those people who have no patience for convoluted Zionist rationalizations, nonsense and lies should avoid Elan Journo and save their time and money. Exposing a Zionist Hoax reveals most of the standard arguments Zionists have used since 1948 to reverse history, to invert morality, to justify mass-murder, to steal a country, and to bamboozle Americans…. The most important book I’ve read for years. As usual, Hammond systematically and calmly shreds the collection of hasabarah myths that Journo (ironic name) has cobbled together. I applaud Jeremy Hammond who, over a number of years, has consistently exposed many myths regarding the origin of the Palestinian/Israeli conflict by not only arguing for acceptance that a great injustice has been done to the Arabs who were forcibly expelled from their homes but also exposing the role and duplicity of many leading nations…. It should be read by all those who wish to untangle myth from reality in this long standing conflict. The elaborate and willfully treacherous accounting that Elan Journo presents regarding the Palestine Conflict in his “What Justice Demands” is masterfully dissected and countered by Jeremy Hammond in his brilliant “Exposing A Zionist Hoax”. At every turn, Hammond presents the facts to counter Journo’s fabrications, thereby disempowering Journo’s Israeli Zionist propaganda. “The lie remains, only until the Truth arrives”. And the Truth has arrived with Jeremy Hammond’s impressive Exposing A Zionist Hoax. For those who truly care about the fate of the Palestinian people in the Palestine conflict, and for whom only the Truth will do, Exposing A Zionist Hoax is a must-read. Exposing A Zionist Hoax, Jeremy R Hammond’s forensic deconstruction of Elan Journo’s book What Justice Demands: America and the Israeli-Palestinian Conflict, is essential reading for anyone who really wants to know where Israel came from and what its plans for the region are. Point by point, Hammond demolishes the dubious claims made by Journo. Along the way, Hammond addresses the facts in relation to Israel’s ethnic cleansing and the legitimacy of Palestinian grievances. He has exposed Journo’s book for what it really is – unapologetically pro-Israel propaganda. 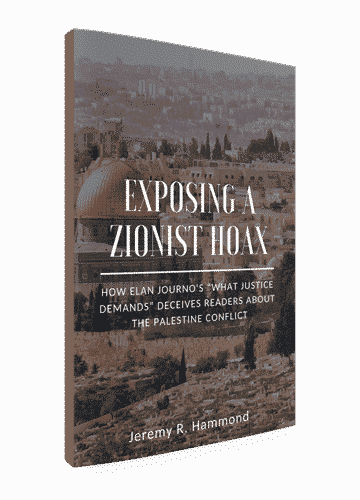 For everyone who genuinely wants to understand and educate themselves on the history and situation of Palestine, I recommend Jeremy R. Hammond’s book Exposing a Zionist Hoax: How Elan Journo’s “What Justice Demands” Deceives Readers About the Palestine Conflict (Worldview Publications 2018)…. I warmly recommend Hammond’s book even for those who have not read, and are not planning to read, Journo’s book. From Exposing a Zionist Hoax, you will find lots of information on the history of Palestine, the establishment of Israel, the ethnic cleansing, occupation, censorship, the economy of Palestine, the ‘peace process’, and so on. Hammond argues convincingly for his moral stand and offers lots of credible sources for his readers to back up his claims…. Even though Hammond has written his book as a response to another, it is written so that it can have value even years after everyone has forgotten that Elan Journo ever existed: Its responsive nature just guarantees that Hammond is not fighting against his own straw men, but he is engaging in a dialogue with authentic and significant Zionist views, claims, and arguments. His thorough investigation and evaluation of this wide range of claims and wide use of sources, in a quite small number of pages, make Exposing a Zionist Hoax a useful handbook for anyone who wants to take a look into the facts. It has become appalling in the last couple of decades the deceit which is reported as if no history or truth exists for the original inhabitants of Palestine, many which were of Jewish descent. Your book is a refreshing relief filled with historical context, fact-based references and exposure to our current and previously nonsensical fact-free stories commonly accepted by the unsuspecting general public with little interest or time to research the evidence or personal connection with the true historical Palestinian community. Thank you for your enlightening effort at freeing the public from this terrible deluge of fiction which demonizes the historical indigenous population who lived together in peace and prosperity sharing resources equitably for centuries. Our future depends on us freeing ourselves from these fallacies. Well researched. Well organized. Well written. Everything I’ve read by Jeremy R. Hammond, including Exposing a Zionist Hoax, has provided a better understand of the ongoing conflict between Israel and Palestine. What's the format and length? Exposing a Zionist Hoax is available in PDF or Kindle editions. The PDF is 152 pages, so it’s a fairly quick and easy read that’s jam-packed with information illuminating how so much of what the general public is told about the conflict is nothing more than lying Zionist propaganda. It’s also fully referenced so you can check my sources and have it as a useful reference for your own efforts to help educate others about the true nature of the conflict, it’s root causes, and the reasons for its persistence. How is it different from your other books on the subject? Exposing a Zionist Hoax draws largely on numerous of my previously published writings, including a number of my articles as well as my other books. But while there is some overlap of information, it is presented more specifically in this book to directly answer popular Zionist propaganda talking points. Furthermore, it draws upon additional research I’ve done but never published anything on, so it contains original insights and information you won’t find in my other books. It is a great companion to my other books! The Rejection of Palestinian Self-Determination: The Struggle for Palestine and the Roots of the Israeli-Arab Conflict is a short book that focuses on Mandate-era Palestine. Benny Morris’s Untenable Denial of the Ethnic Cleansing of Palestine is another quick read that focuses on the 1948 war and directly addresses the arguments used by those who deny that ethnic cleansing occurred. While Exposing a Zionist Hoax draws upon these other books, I think you’ll find it useful to review the information where there is some overlap, and that all these books compliment each other well, helping you to fully round out your knowledge. And particularly if you’re looking for a good resource giving you the arguments you need to answer the talking points of Zionist apologists for Israel’s crimes against the Palestinians, you’ll want to read Exposing a Zionist Hoax in addition to my other books. Get the PDF Edition Along With All My Books for One Low Price! Instead of purchasing each of my books separately, save big by taking advantage of one of my book bundle deals. (By buying directly from me rather than a retailer, there’s a cost savings, and I’m able to pass some of those savings back to you.) Just choose choose between a hardcover or paperback edition of my seminal work, Obstacle to Peace: The US Role in the Israeli-Palestinian Conflict! Buy My Book Bundle and Save! Prefer to Buy Exposing a Zionist Hoax Individually?